Small, rather dark, thick-set heron. Adult has black crown with long nape-plumes , bluish grey upperparts, buff-fringed coverts and greyish neck and underparts, with a marked facial pattern. Legs are rosy, yellowish or pink. 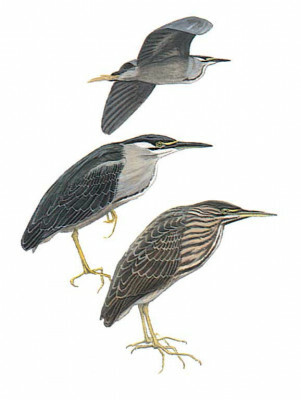 Immature brownish with white spots on tips of wing coverts, brown and white streaked upper breast and yellowish green legs. In flight birds show dark upperwings with no obvious pattern. Solitary and often skulking, adopting a crouching position if disturbed. Most active at dusk.